The Union Minister of State (Independent Charge) for Development of North-Eastern Region (DoNER), MoS PMO, Personnel, Public Grievances, Pensions, Atomic Energy and Space, Dr. Jitendra Singh announced a new direct daily air flight from Delhi to Dimapur in Nagaland via Kolkata and back along the same route from 15th April onwards, in addition to another daily flight from Kolkata to Silchar and back which was resumed from 20th of last month. Dr. Jitendra Singh was addressing the inaugural session of 64th Plenary Meeting of North-Eastern Council (NEC), here today. Admitting that air connectivity has always been an issue for the North Eastern Region, Dr. Jitendra Singh said, three hangers had been constructed and made functional by the Airport Authority of India at Guwahati airport with NEC support and hoped that Guwahati airport would soon become a regional hub for air flights. The Plenary meeting was attended by Governors and Chief Ministers of North Eastern States, senior Officers from State Governments, union Ministries and other central Government Organizations. Elaborating on some of the innovative initiatives taken during the last few months, Dr. Jitendra Singh referred to a unique practice of holding the Ministry of DoNER’s camp office by rotation in each of the eight North-eastern States starting from February this year which has been designated as “DoNER at Doorstep” (DAD). In addition to allowing closer interaction of DoNER officials at the ground level, he said, this practice will also help in sending a psychological message to the people of the North East that they need not travel to Delhi each time for the redressal of their grievances but Delhi can also come to their door step. 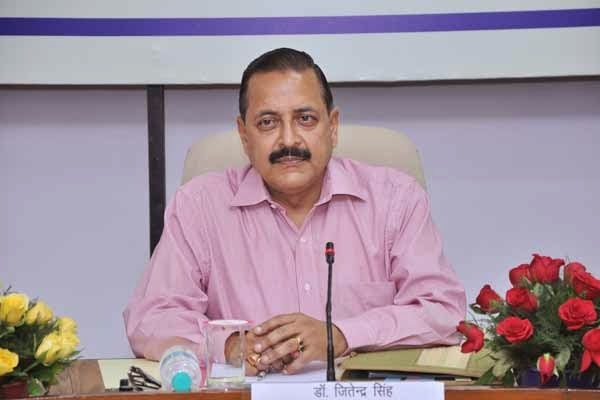 Dr Jitendra Singh said, the Prime Minister attaches a great deal of importance to the development of the North Eastern Region and accordingly he has advised all his colleagues to visit the region and personally monitor the implementation of their Ministry’s schemes and programmes in the NER for understanding the issues concerning each of the States. As per the new arrangement, at least eight Union Ministers would visit the NER every fortnight, he added. Dr. Jitendra Singh further reminded the members of the Council that Central Government has announced in the Union Budget 2015-16 that manufacturing hubs would be set up through Indian private sector participation in South East Asian Countries which would boost trade and commerce between the landlocked North East and neighbouring countries. He also mentioned the decision to set up All India Institute of Medical Sciences (AIIMS) in Assam, Indian Institute of Science Education and Research (IISER) in Nagaland and Centre for Film Production, Animation and Gaming in Arunachal Pradesh. The Secretary, NEC, Shri Ameising Luikham presented his report on the activities of the Council during the preceding year which includes important events that have taken place during 2014-15, major initiatives, projects and schemes that have been taken up and some areas of concern requiring the attention of the Members of the Council. The implementation of the Annual Plan 2014-15 and the Sectoral allocation for the Annual Plan 2015-16 were highlighted. Discussions were held on the various developmental activities taken up in the North Eastern region by the different Ministries and Government organisations including the Ministries of Railways, Road Transport and Highways, Civil Aviation, Inland Waterways Authority of India, Power, Tourism, External Affairs on Act East Policy, Home Affairs on Border Trade – status on ICPs, Land Custom Stations, Border Haats, Banks, Visa facility etc, Human Resource Development, Department of Telecommunication, Skill Development and Entrepreneurship, Department of Financial Services on financial inclusion and banking services issues in NE Region and North East Space Application Centre, etc. Renowned international tennis players Mr. Goran Ivanesivic (2001 Wimbledon Champion, Runner up Wimbledon 1992, 1994 & 1998 & Coach to US Open Champion Marion Cilic), Mr. Tim Henman (6 times Britain’s number one, four times semi finalist at Wimbledon, Semi Finalist at the French & US Open) and Mr. Dan Bloxham (Head Coach at The All England Lawn tennis Club, Wimbledon) participated in tennis camp organized by Rashtrapati Bhavan in association with All India Tennis Association and All England Club Wimbledon for the children of President’s Estate today (April 9, 2015). 25 children met these stars and received tips for their future career in tennis. The Rashtrapati Bhavan provides coaching classes, equipment and nutritious meals for children of President’s Estate in tennis, table tennis and squash to enable them reach national/international standards under its ‘Sports Plus’ Initiative. The Prime Minister, Shri Narendra Modi has bowed to Guru Teg Bahadur ji, on his Prakash Utsav. "On his Prakash Utsav I bow to Guru Teg Bahadur ji. His bravery and spirit of sacrifice will always inspire people", the Prime Minister said. Delegation led by Mr. Colin Barnett Premier of Western Australia called on the Minister of State for Agriculture Sh. Mohanbhai Kalyanjibhai Kundariya at Krishi Bhawan, New Delhi today. During the discussion with the delegation from Australia, Sh. Kundariya mentioned about Australia’s high efficient agriculture sector with expertise and technology to support agricultural productivity across a range of areas. Sh. Kundariya said that Australia has been importing a number of agriculture commodities from other countries of the world and India is in a position to export cake of soyabeans, soyabeans cashewnuts, chickpeas, coconut, coconut oil, ginger, grapes, groundnuts, lentils, oranges and vegetables. He urged to consider importing these commodities from India. Sh. Kundariya said that India would like to collaborate with Australia in the areas of logistics, in particular cold chains and warehousing, agriculture processing in particular horticulture and fisheries and productivity enhancement. The Australia team invited the officials from Minister of Agriculture to visit Australia and study the model of working for storage of food grains, logistic. They emphasized on research and technologies on increasing productivity in Agriculture. Directorate General of Civil Aviation (DGCA) has identified seven key safety priorities and developed corresponding safety action plan to mitigate the identified risks. One of the key safety priorities is to reduce “runway excursions and overruns”. One of the factors leading to runway excursions is unstabilised approach which continue to landing. To emphasize this issue and develop action plan for reducing unstabilised approach which continue to landing, data for the year 2013 and year 2014 were analyzed and shared with the stakeholders during a meeting held on March 27, 2015 at DGCA, HQ. The study also points out that majority of unstabilised approaches have continued to landing, which mirrors the worldwide trend. The aim of DGCA’s endeavour is to encourage pilots to go around when approach becomes unstabilised. It also aims to reduce the number of unstabilised approaches by policy intervention and participation by all stake holders and fine tuning of training of pilots. Earlier, DGCA has issued instructions in the form of circulars. Air Safety Circular 07 of 2004 prescribes speed control during approach (below FL100 and below 3000 feet and within 20 nm). The Operation Circular 01 of 2013 emphasizes on non-punitive policy towards Go Around. The Air Safety Circular 03 of 2010 requires the presence of cabin crew inside the cockpit and occupy the observer seat in the event if any of the flight crew member leaves the cockpit. The cabin crew in the flight deck will remain vigilant in case of subtle incapacitation of the flight crew member or any other situation that requires assistance. The cabin crew shall remain in the flight deck till such time the flight crew member returns to the cockpit. The Twentieth National Oil Spill Disaster Contingency Plan (NOSDCP) and Preparedness meeting was held at Goa, today. Vice Admiral HCS Bisht Director General Indian Coast Guard, Chairman NOSDCP, chaired the meeting. A total of eighty delegates including representative of various Ministries, Central and State Government departments and agencies, Ports and Oil Companies attended the meeting. A highlight of the meeting was the release of the revised National Oil Spill Disaster Contingency Plan by Vice Admiral HCS Bisht Chairman NOSDCP. The comprehensively revised 2015 edition of the NOSDCP reflects current international norms and best practices, key relevant national regulation, experience gained since publication of first edition in Jul 1996 and valuable inputs received from stakeholders to the national plan. While the earlier editions of the NOSDCP covered only oil spills, the revised edition initiates national preparedness and response to Hazardous and Noxious Substance (HNS) incidents also. Yet another highlight of the meeting was the release of the Online Oil Spill Advisory (OOSA) system by Dr. SSC Shenoi, Director Indian National Centre for Ocean Information Services (INCOIS). The OOSA system developed by INCOIS places India among a select group of countries to have indigenously developed an online prediction system for movement of oil spills and significantly enhances the efficacy of national response to marine oil spills. The 20th NOSDCP meeting reviewed the national capabilities with the common aim to ensure collective preparedness to respond to any oil spill contingency in Indian waters. Vice Admiral HCS Bisht also recollected the minor incidents of pollution damages over the past year and the oil spill in Bangladesh which caused damage to the fragile eco system of the Sunderbans Delta and urged persons in charge of all ports and oil installations to review their plans and resources for oil spill contingencies in Indian waters. The Union Minister of State for Home Affairs, Shri Kiren Rijiju has said that the government is committed for strengthening the Border Security Force (BSF). Shri Rijiju was addressing the Induction Ceremony of Two Mi – 17 V5 Helicopters into the BSF, here today. The Minister said that the induction of these two helicopters into the BSF will bolster the air support missions for BSF troops along India’s borders and in the hinterland during anti-LWE operations. The Russian made Mi- 17 V5 choppers will boost the flying capability of BSF Air Wing and these will be deployed for a variety of Internal Security related tasks and also in some of the most arduous and inhospitable conditions on the borders, he added. Shri Rijiju said that the choppers are armed with the latest in avionics and night flying capabilities, both of which were longstanding BSF requirement. The Director General, BSF, Shri D.K. Pathak and other senior officials from the Ministry of Home Affairs and BSF were present on the occasion. ‘Suleiman Charitra of Kalyana Malla,’ a book translated from Sanskrit by acclaimed writer and former diplomat Shri A.N.D. Haksar, was launched at a function here today in collaboration with the National Foundation for Communal Harmony (NFCH). The classic literature, ‘Suleiman Charitra,’ is a work by Kalyana Malla, an esteemed poet at the court of Lodhi prince Lad Khan in eastern Uttar Pradesh at the beginning of the 16th century. NFCH Secretary Shri Ashok Sajjanhar said this was a proud moment for the Foundation since the values propagated through the book are the same as the objectives of the Foundation. Addressing the gathering, Shri Haksar said if the book contributes even a bit towards the goals set by the NFCH, he will be happy to have contributed towards the cause. On the occasion, the Director General of Indian Institute of Mass Communication, Shri Sunit Tandon read out passages from the book while Prof. Akhtar ul Wasey, National Commissioner for Linguistic Minorities, conducted the book release proceedings. NFCH, an autonomous organization with the Ministry of Home Affairs, seeks to promote Communal Harmony and National Integration. Among others, its activities include granting financial support for rehabilitation of child victims of communal, caste, ethnic or terrorist violence. The Committee of Eminent Freedom Fighters will hold its 2nd Meeting in Srinagar, J&K, tomorrow. Headed by the Union Minister of State for Home Affairs Shri Kiren Rijiju, the Committee will look into the issues of concern to the Freedom Fighters. The Committee will consider issues including granting reservation in Central Government Services to all Dependents of the Freedom Fighters, permitting Grand Sons and Daughters of the Freedom Fighters to study in the Central Schools spread all over India, providing employment to families of the Freedom Fighters including Petrol Pump, Gas Agency etc, giving job in Railways to at least one person recommended by Freedom Fighters and providing free electricity to all the Freedom Fighters. Also on the Committee’s daylong meeting, the agenda includes extending Bank Loan to Dependents of all the Freedom Fighters, providing Temporary Accommodation/Stay for the Freedom Fighters in District Headquarters, revalidation of Orders related to Medical Facilities provided to Freedom Fighters, Renewal of complimentary Railway Passes for three years instead of one year, extending free Railway Passes to all eligible Dependents/Successors of Freedom Fighters and free toll tax to all Freedom Fighters while travelling on National Highways. The Committee will also consider increasing the Basic Pension of Freedom Fighters/Daughters, Verification of Freedom Fighters/Dependents Family Pensioners, Switch Over of PPOs from SBI to Other Nationalised banks, Mandatory Transfer of PPOs from Treasuries to Banks besides confirmation of the minutes of the meeting held at Port Blair on September 3, 2014. The Ministry of Mines has prepared the draft rules named “The Mineral (Auction) Rules, 2015” for enabling auction of the mineral concessions as provided under the MMDR Amendment Act, 2015. The draft Mineral (Auction) Rules, 2015 have been uploaded on the website of the Ministry of Mines yesterday, inviting comments/ suggestions from the general public, Governments of States / Union Territories, Mining Industry, Stake Holders, Industry Associations, and other persons and entities concerned by 23rdApril, 2015. Earlier on 2nd April, 2015, the Minister of Steel and Mines has stated, at his press conference, that the draft Rules to enable auctions of mineral concessions would be put out for consultation with the stakeholders within a week. The Mines and Minerals (Development and Regulation) (MMDR) Amendment Act, 2015 has been notified on 27thMarch, 2015 to amend the MMDR Act, 1957. The Amendment removes discretion in the grant of mineral concessions. Henceforth, all mineral concessions will be granted by the respective State Governments only through auctions, which will bring greater transparency and remove discretion in allocation of mineral resources. In this process, the Government will get increased share of revenue from the mining sector. Unlike in the 1957 Act, there would be no renewal of any mineral concession. The tenure of mineral concessions has been increased to 50 years compared to the earlier provisions of 30 years. Thereafter, all Mining Lease would be put up for auction (and not for renewal as in the earlier system).